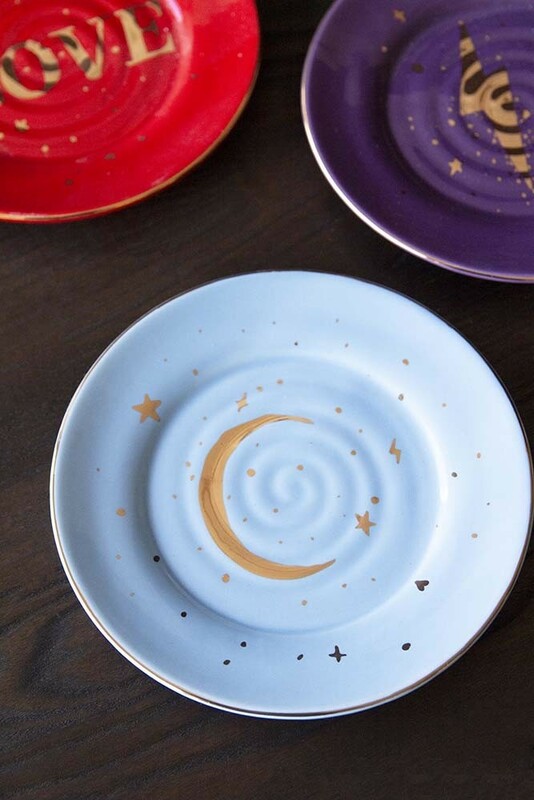 Incorporate bright colour and starry scenes to your kitchen crockery collection or display spots! A fabulous addition to our collection of tableware, the Set of 4 Love & Lightning Plates promise to brighten even Monday mornings in the kitchen! Made from porcelain and measuring 17cm, these colourful plates are sold as a set of 4 and include a different design on each plate. 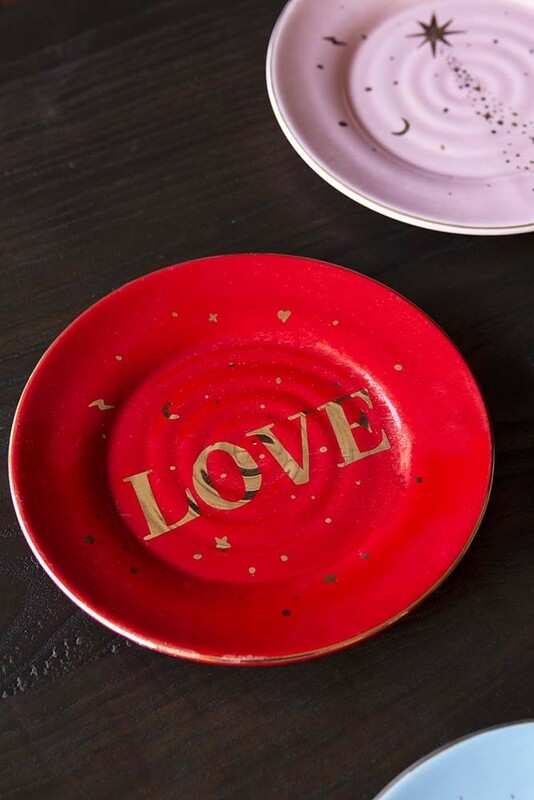 Hand painted in a bold palette of rich red, royal purple and pastel pink and blue, the Love & Lightning plates include accents of glittering gold to add a little luxury to the everyday. Please note, as these plates are carefully hand painted, they are not safe for the dishwasher and should be washed by hand to maintain the beautiful finish. 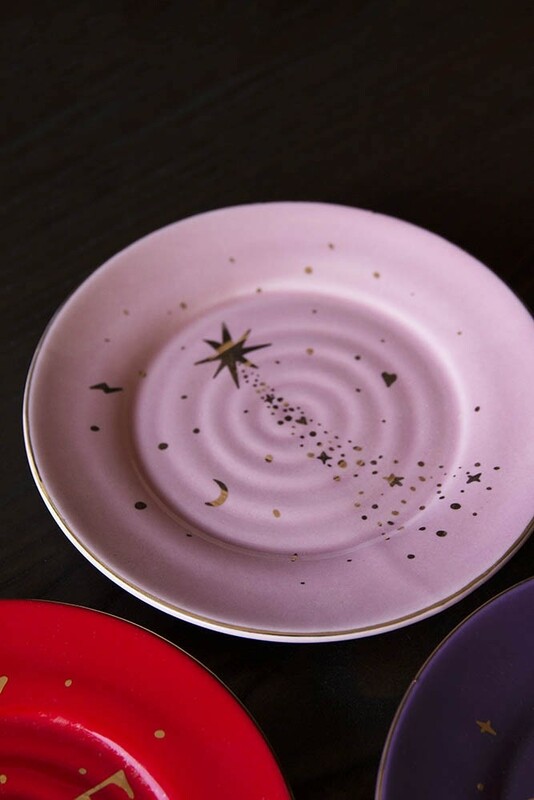 Designed by Dutch ceramic artist Anouk Kramer, the Love & Lightning plates take inspiration from the universe with shooting stars, celestial moons and lightning bolts painted in gold. Ideal for creative display spots or kitchens with character, we know you’ll love these colourful gold plates as much as we do! 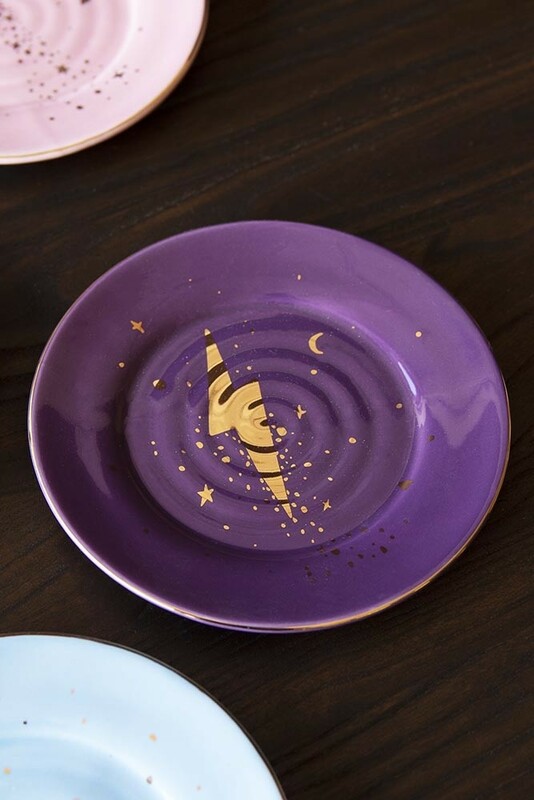 Introducing tableware that is simply out of this world, the hand painted glamorous gold stars and bold love lettering make these 4 plates a special addition to any kitchen and the perfect gift for loved ones! Almost too beautiful to eat from, we wouldn’t blame you if you decided to leave these as display only! Using a plate display hook, you could mount these plates on your wall as part of your picture or gallery wall or alternatively pop them on plate stands in your living rooms, hallways and bedrooms. Alternatively use these plates for toast and crumpets in the morning or a welcome tea and cake break in the afternoon. 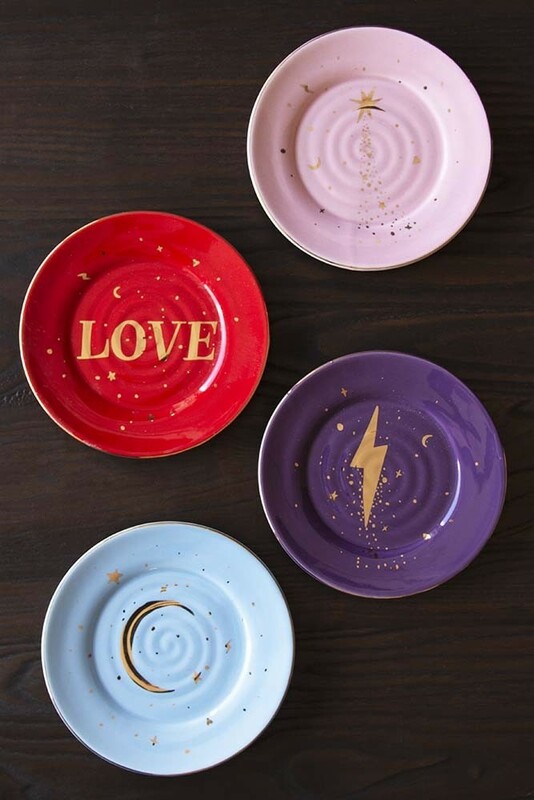 If you are using these plates in the kitchen then we’d keep the colourful Set of 4 Love & Lightning Plates in prime position on your open shelving or glass cabinets and enjoy the touch of the extraordinary that these plates will bring to your home! The Set of 4 Love & Lightning Plates would also make a fabulous gift for home movers, newly weds, loved ones or simply that special someone in your life.